This little ring is simply adorable. Wear this when you are ready to go out and have a good time!! 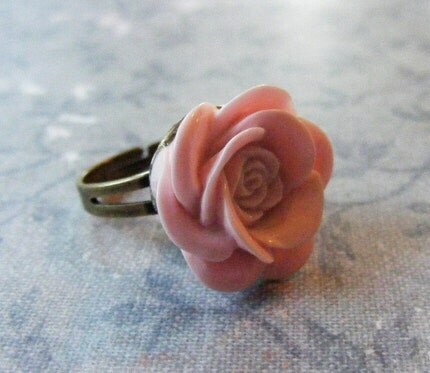 The 18mm resin rose cabochon is a gorgeous soft pink color. It has incredible detail and a very lovely glossy finish. The ring base is a wonderful antique brass which is adjustable from about 6 1/2 and up. Don't let this one get away!! Folksy :: Buy "Scarlet Ring"
Folksy :: Buy "Bridesmaid Pink Rose Ring"
Folksy :: Buy "Bethany Ring - Swarovski Pearl"